Supporters gather outside the courthouse in Turkey. Photo by Arzu Geybullayeva. A small crowd was gathered outside Caglayan court. They held “Free Taner” signs while representatives from the Amnesty International’s Turkey office were read their demands out loud. 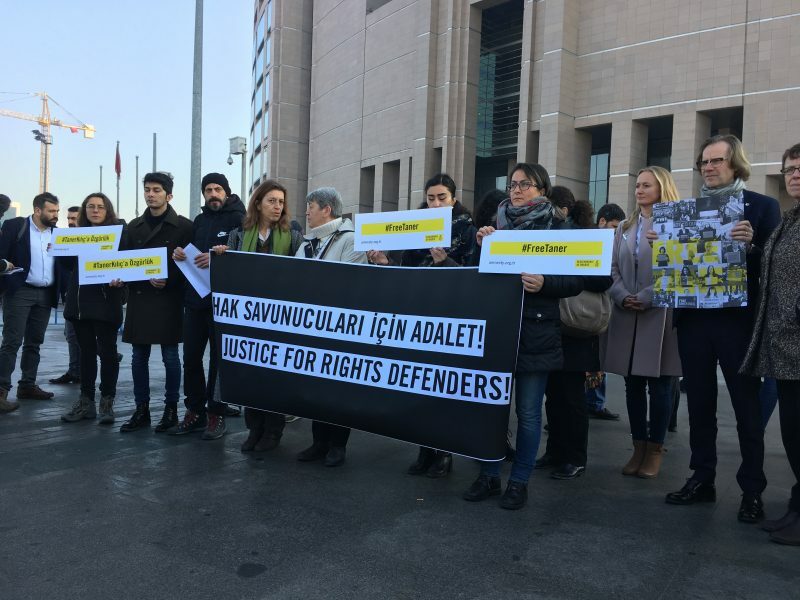 “We demand an unconditional release for Taner,” said one of the human rights defenders, speaking to a group of journalists at the January 31 gathering. There was a palpable burst of surprise and relief among family and friends when the court ordered the conditional release of Taner Kilic, chair of Amnesty International Turkey, who has spent eight months in prison. He was the only one left behind bars after the court released all members of the #Istanbul10 human rights defenders group in October of last year. This joy was short-lived, however. The prosecutor — who had already requested that Taner be kept in detention — immediately appealed the decision, and the second court granted the request. Just a day later, the first court accepted the second court’s decision to continue his detention. Kilic is now likely to remain in jail until the next hearing, which is scheduled for June 21, 2018. This is the latest example of the crisis in Turkey’s justice system that is ruining lives and hollowing out the right to a fair trial. To have been granted release only to have the door to freedom so callously slammed in his face is devastating for Taner, his family and all who stand for justice in Turkey. Kilic is accused of being a member of a terrorist group, a charge that his supporters and the international human rights community have broadly dismissed as bogus. More precisely, Kilic is accused of using a messaging app called ByLock that was allegedly used by coup plotters in July 2016. Kilic and his lawyers argued no such app was ever downloaded on his phone during the hearing yesterday. Taner presents the evidence that he didn’t download or use ByLock. The prosecution hasn’t presented any that he did. Despite this, the prosecutor requests that Taner remains in pre-trial prison detention. Taner’s lawyer presents a third expert witness report to the court that again concludes that Taner didn’t use ByLock. This one shows that Taner had two ‘mor beyin’ apps known to falsely show connections to ByLock. It is absolutely clear that Taner didn’t have ByLcok. Kilic joined the hearing via video link as he was bring held in a prison in the western province of Izmir. He has denied using the app on many occasions, including on January 31. After several hours of witness questioning, the court took a brief recess, after which it announced its ultimately short-lived decision to release Kilic on bail. Court rules to release Amnesty Turkey chair Taner Kılıç. At last!!! The brother and daughter of #TanerKılıç overjoyed at the news of Taner’s release. One step towards justice! This is not the first time a court has overruled its own decision. Utterly shocking! Ordering prisoners’ release and immediately throwing them back to jail seems to become a habit of #Turkey‘s judiciary. This was applied to several #journalists last year. The author of this article attended the January 31 hearing at the Caglayan courthouse in Istanbul.